There are many benefits to concrete cleaning & sealing. First off if your concrete is cleaned it adds curb appeal which adds value to your home. Then there is the preventive maintenance factor, when you add the sealer to your cleaned concrete you are doing more than adding a glossy look, more importantly you are protecting your investment. Every year our concrete goes through a freeze thaw cycle, which can cause damage to your concrete if it has water seepage. When water freezes it expands 9% in size and that’s what causes the spalling or scaling of concrete. Which is the number one reason concrete is repaired. This all can be prevented by proper installation and proper maintenance of your concrete. This is why we always stress applying the sealer after you concrete has been cleaned, the proper sealer will basically waterproof your concrete . A sealant will also benefit from future stains penetrating your concrete. 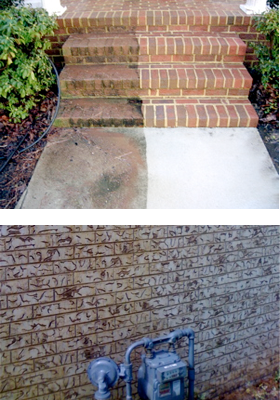 We use hot water pressure washer with medium pressure and the proper solvents to clean your concrete. Ask about our waterless concrete cleaning, takes those stubborn oil stains out every time without the water. We will give a free demonstration of the NEW waterless green clean concrete cleaner. When it comes to masonry & concrete cleaning and maintenance we know the importance of how to care for your stone. There are many reasons to have a professional contractor clean and restore your home or building. When Midwest Maintenance is involved in any stone work, we do an extensive overlook of the job and what it entails. A lot of the times tuck pointing and patching is involved in stone care. These repairs are very important when it comes to the longevity of your structures soundness, so we don’t over look anything. Once repairs are made then we go to the cosmetics of the structure. The process of choosing the right solvent and cleaning method is what brings your property back to life without damaging the stone. Most structures benefit from applying a sealant after the structure has been restored to keep from any water penetration and further damage. We look forward to cleaning your concrete . We also do graffiti removal!